Meet 9 Austrian hardware and health tech startups coming to Hong Kong and Shenzhen to attend a short incubation programme and to present themselves at the 'Global Sourcing - Mobile Electronics Fair'. Make them feel welcome and join our Austrian Hong Kong Startup Nite! The startups are also interested in individual meetings in Hong Kong and Shenzen from April 15 – 26. A very good friend of Hong Kong, the President of the Austrian Federal Economic Chamber and Austria’s "Mr. Startup" Dr. Harald Mahrer and the Under Secretary for Innovation and Technology Dr. David Chung will get us started and motivated to connect even more! Annamaria Andres, the Program Managers of Austria’s Global Incubator Network (GIN), will introduce how Asian startups could benefit from using Austrian as their hub to find partners and clients for all of Europe. Carina Margreiter from GIN and Dorathy Lee from the Austrian Trade Commission will guide you through the pitching session. 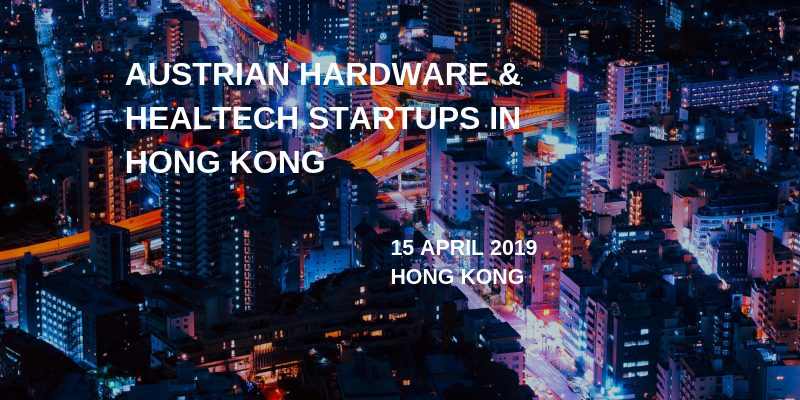 9 Austrian hardware and health tech startups from Austria will then have spent the first day of a stay until April 26 in Hong Kong and Shenzhen and will be eager to hear your feedback, suggestions with whom to connect and also to meet you individually. Now it’s time to get connected with the Austrian – Hong Kong Startup Community: Exchange experiences, share your ideas and discuss future opportunities. And enjoy some Austrian wine and finger food. Looking forward to you joining us at the Austrian-Hong Kong Startup Nite!